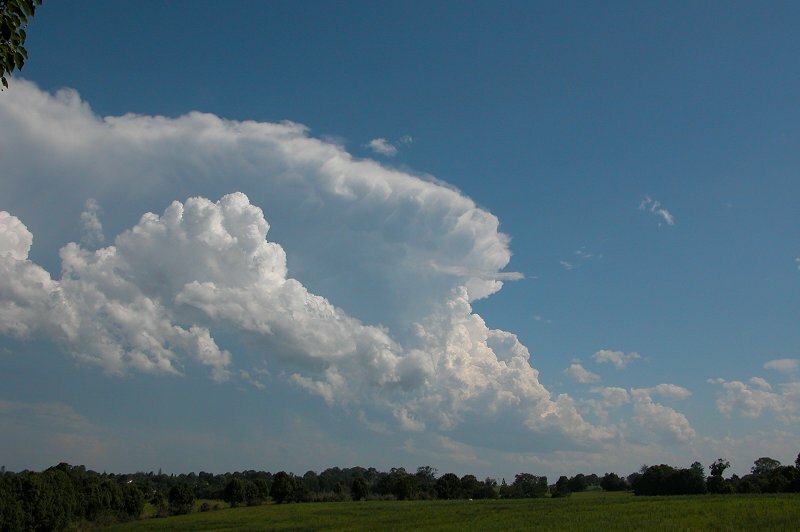 For the previous three days of storm activity, check out part 2 of the nine day outbreak. 500hPa and 300hPa temps had dropped down to -12C and -40C respectively thanks to an upper trough. An area of -6 LIs and 2000 CAPE was sitting right on the coastline - reaching an amazing -10 and 4000 well offshore! Shear profile was excellent, with great low level turning and reasonably strong winds at all levels. The lower levels were unfortunately very dry, as were upper levels and strong capping was also present. 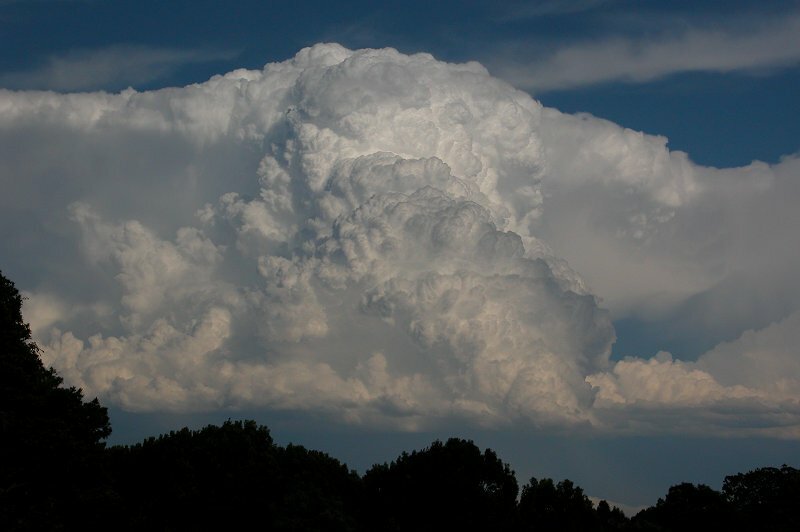 It was a difficult day to pick - I was unsure whether there would be sufficient moisture for storms to develop. 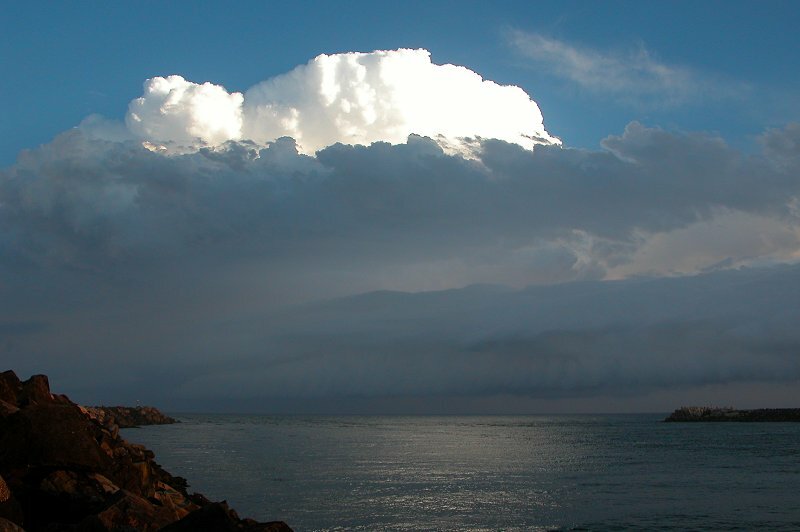 If they could, impressive coastal and offshore supercells with explosive updrafts were highly likely. 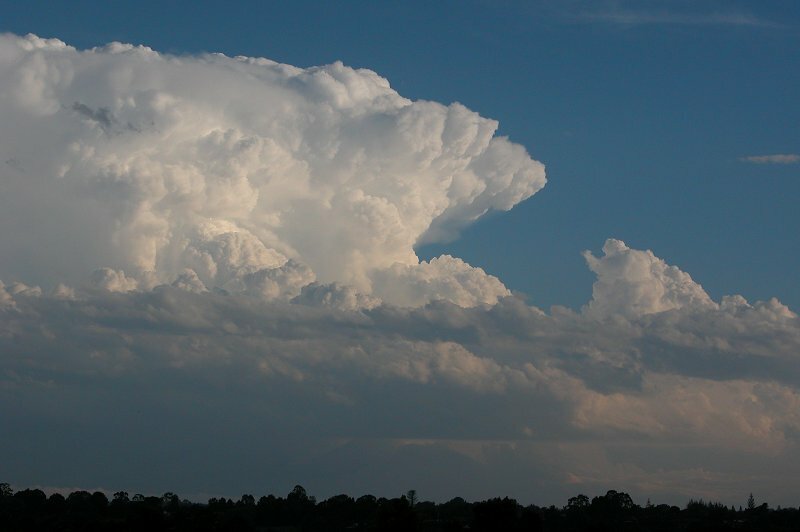 The Bureau had hinted at this with their forecast, which stated storms with damaging winds and large hail were likely during the afternoon. 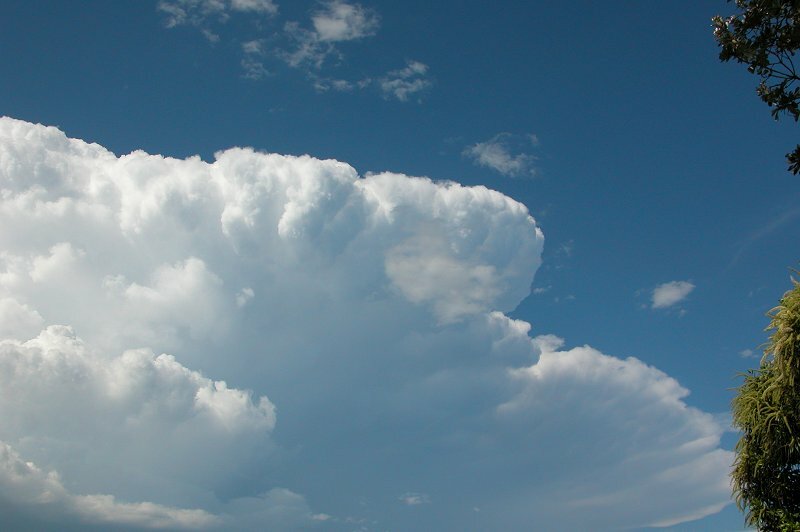 I nearly fell over when at 1.28pm I looked out to the west and saw a storm developing! It was so dry and capped in that area! 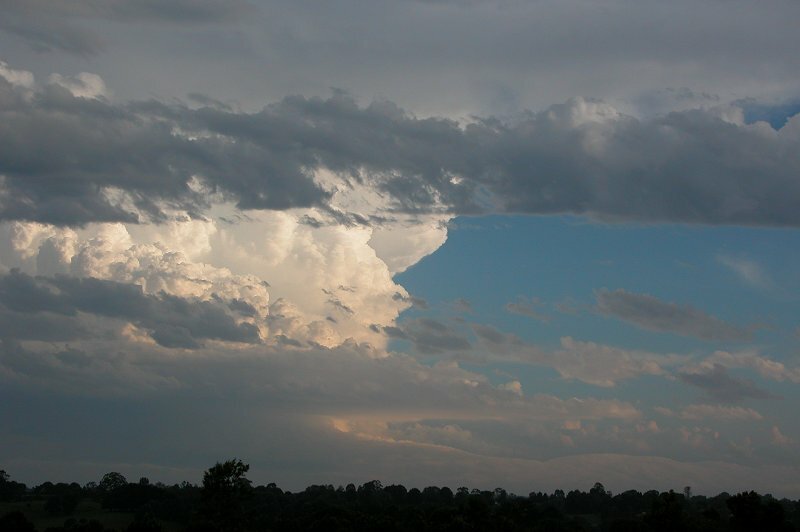 But sure enough, after one or two updrafts it completely evaporated - anvil and all! 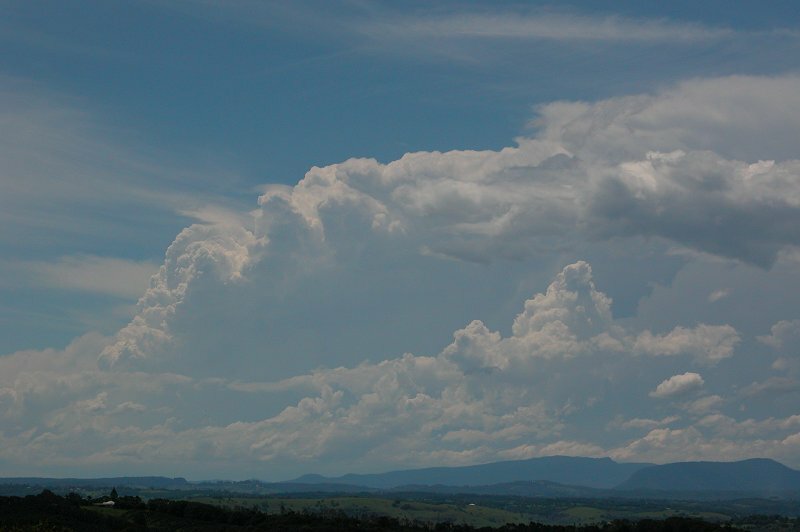 Further weak convection which was high based and low topped developed throughout the coastal area of the Northern Rivers by around 3.00pm, giving some local thunder. 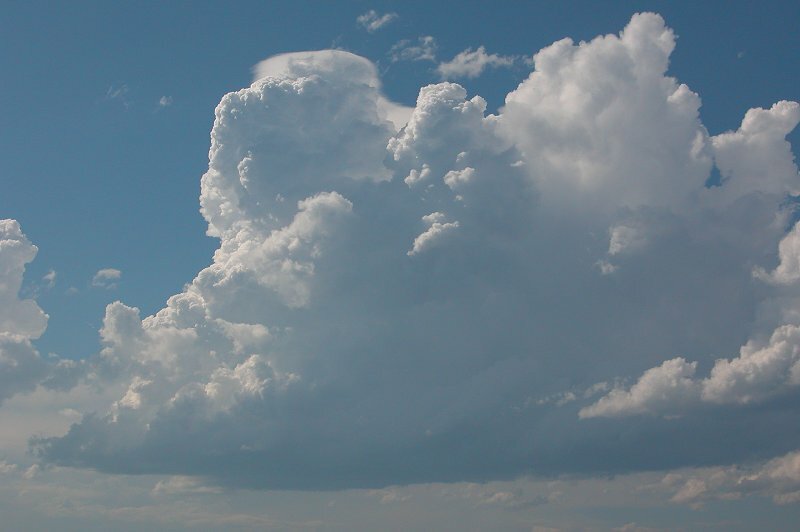 It was't until 4.00pm that some slightly stronger looking convection occurred to my SW. 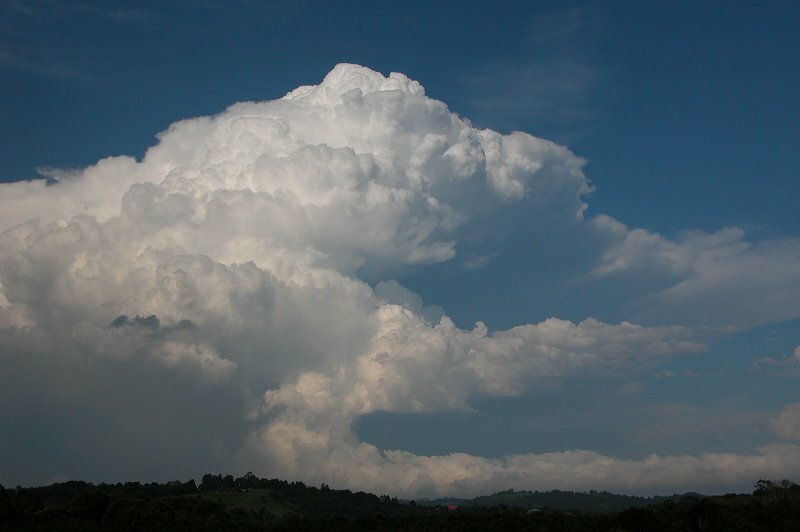 It was also high based, but the updrafts looked quite strong. 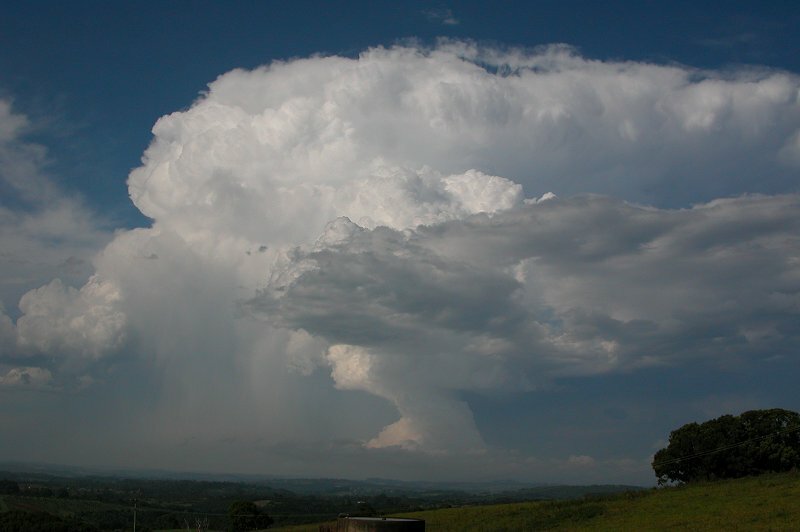 This continued to explode as it got closer to the coast. 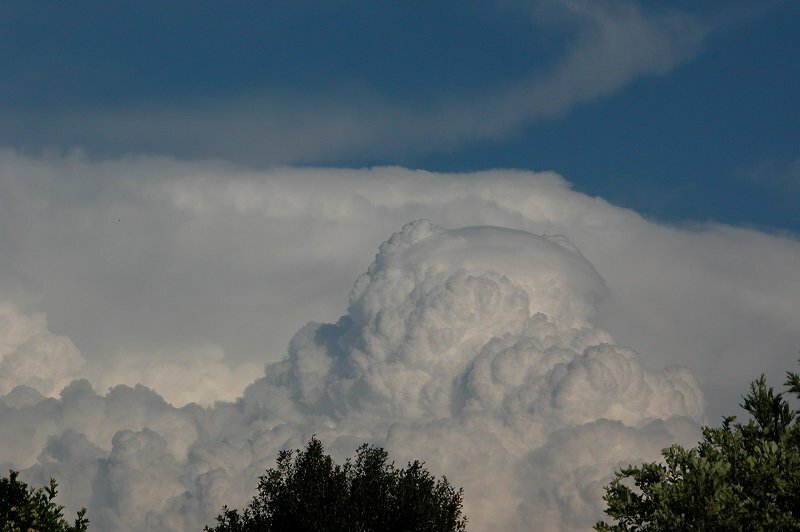 Another cell developed just NNW of my home at 4.20pm, producing explosive updrafts topped with pileus. 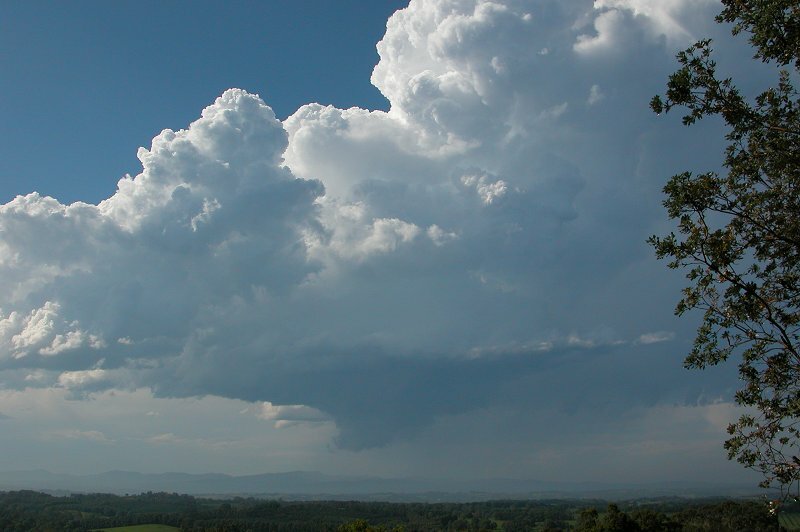 By 4.40pm this storm produced a nice lowering which was quite significant given the very dry lower levels. 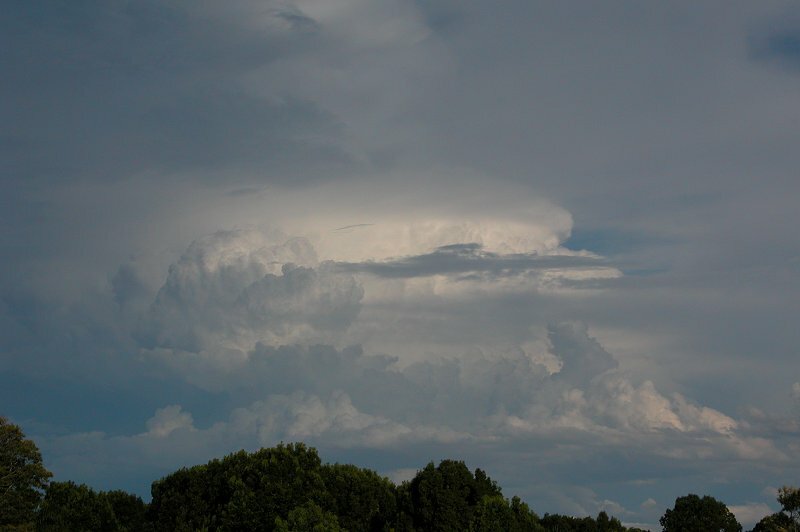 I believe had the LCL been lower, it is likely this cell would have become quite a supercell. 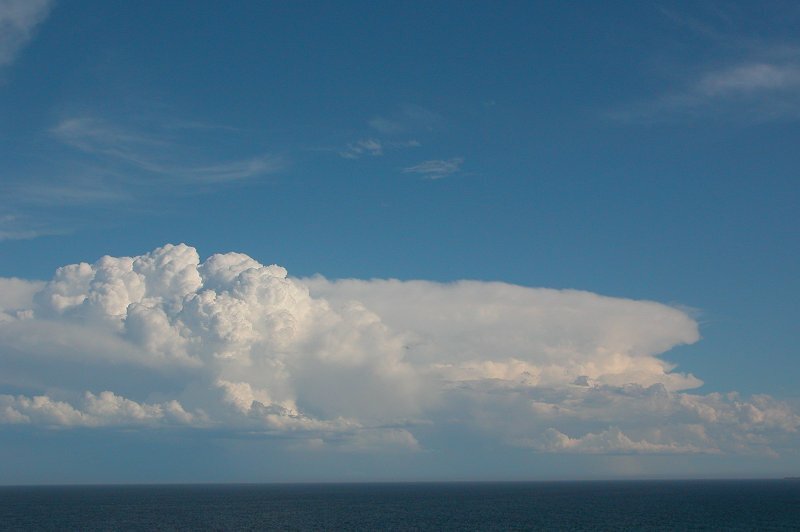 Three storms sitting just on the edge of the coastline south of me, each around 30-40km apart from one another, were just exploding - some of the most amazing updrafts and solid anvils I have ever seen. It was quite spectacular to watch! 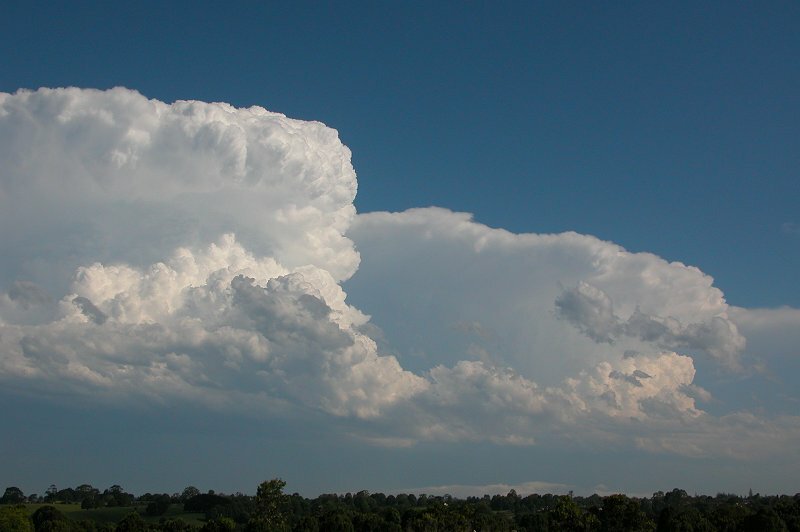 The strongest of the three cells was the one furthest from my location and it soon exhibited both visual and radar features which indicated it was a supercell. It was now 5.05pm and attention turned back to the cell which was earlier NNW of my place. 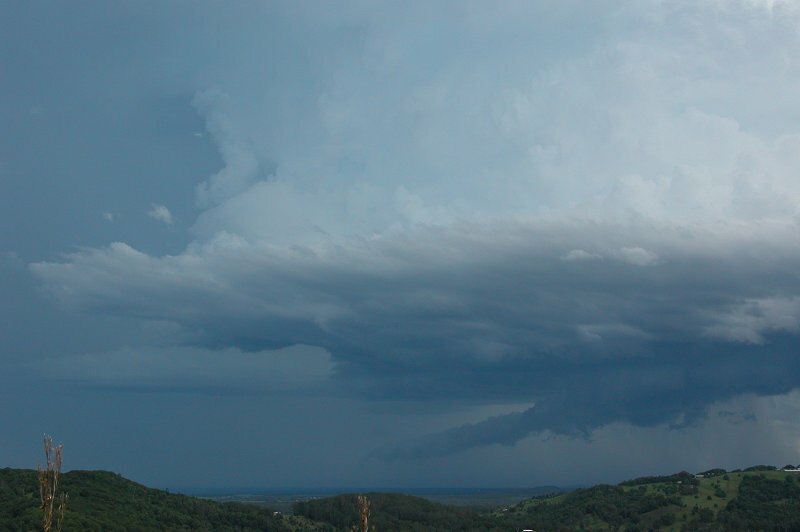 The cell had now moved over Byron Bay and produced some incredible structure. 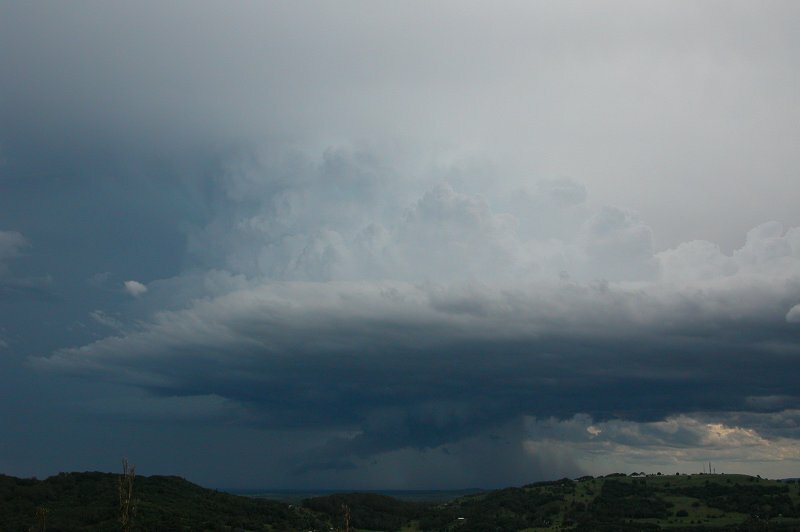 I am unsure what the lowering at the back of this cell was, but it sure caught my attention! 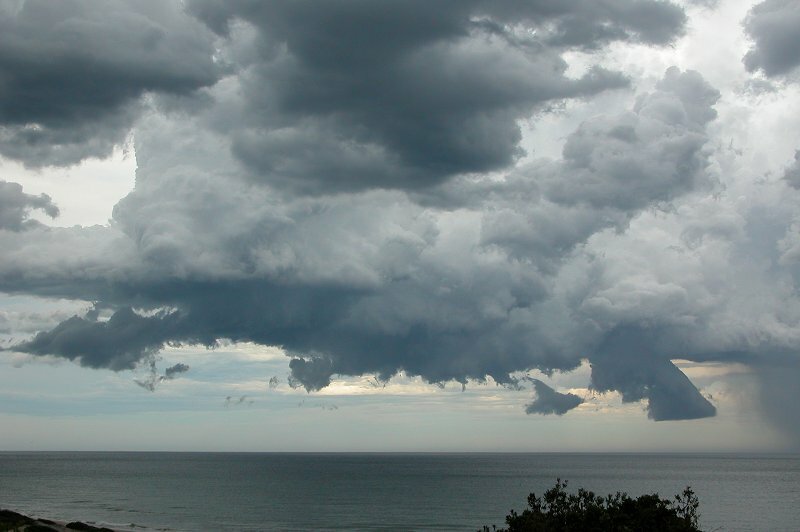 The cell had a solid red core on radar just off Byron Bay. Soon after it split, however it was the left mover that weakened and died, with the right mover continuing on out to sea. Meanwhile the cells off the coast to my south continued to explode and had quite large red cores on radar. At 5.50pm, more strong updrafts were visible at the back of the cell which had moved well offshore but was now almost east of me. 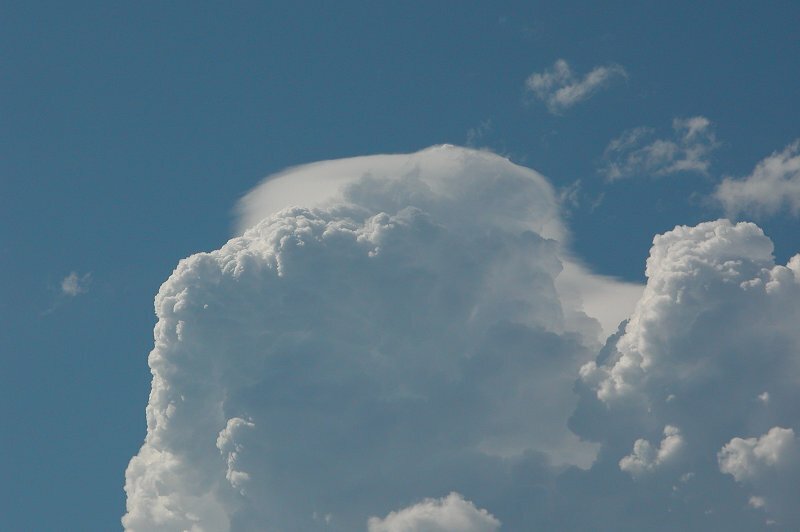 Some nice pileus was observed on the updrafts. 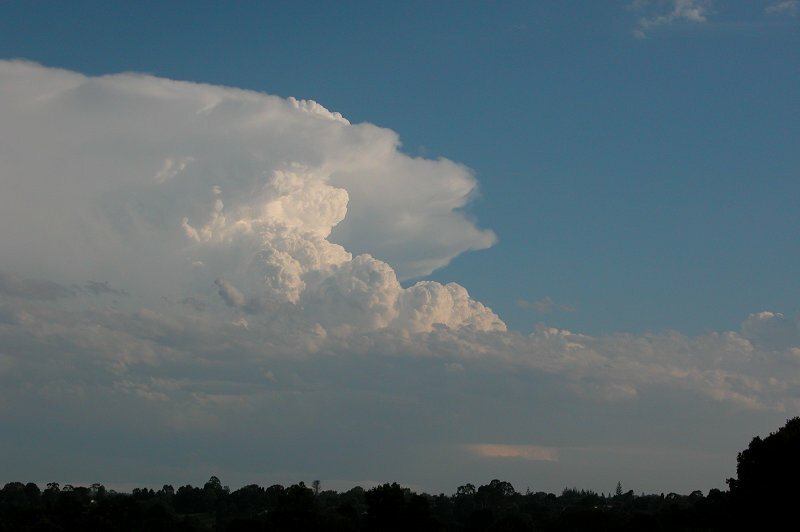 But the really serious activity was further south, with quite a large supercell just exploding off the coast! Everything about it was solid, and as it moved closer, base features were starting to become visible. 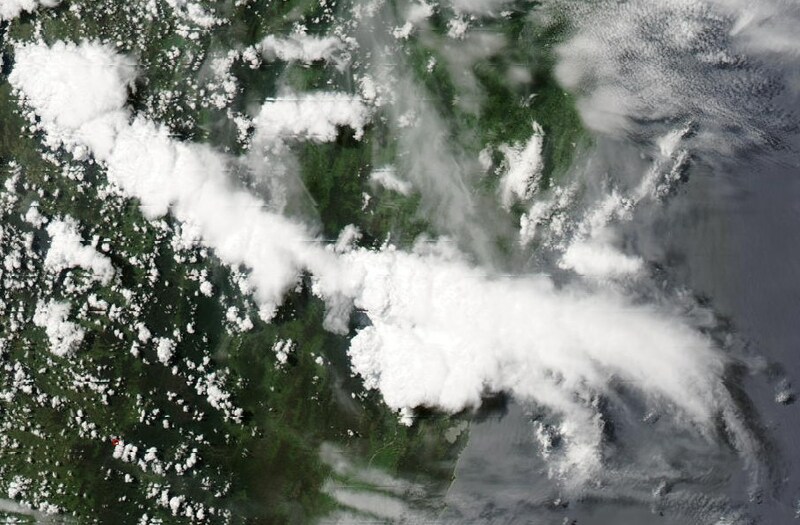 At 6.34pm The back of the severe squall line which had moved through SE QLD was visible now to the NE, although it wasn't nearly as entertaining as the more solid updrafts closer to our area (although the base features sure kept the SE QLD's entertained!). It was also now apparent that the supecell to my ESE was veering significantly left of the mean steering winds. At one point it looked to almost veer NNW on radar!!!! 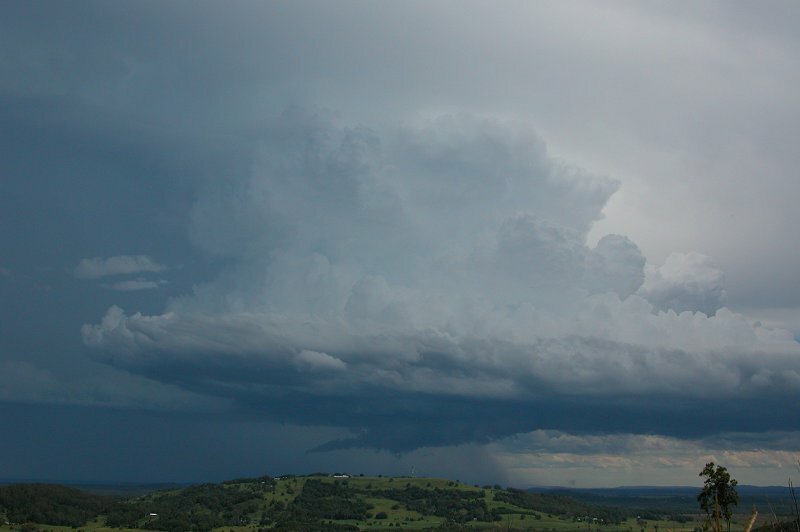 A massive inflow band feeding into what looked large like a mesocyclone could be made out in the distance. 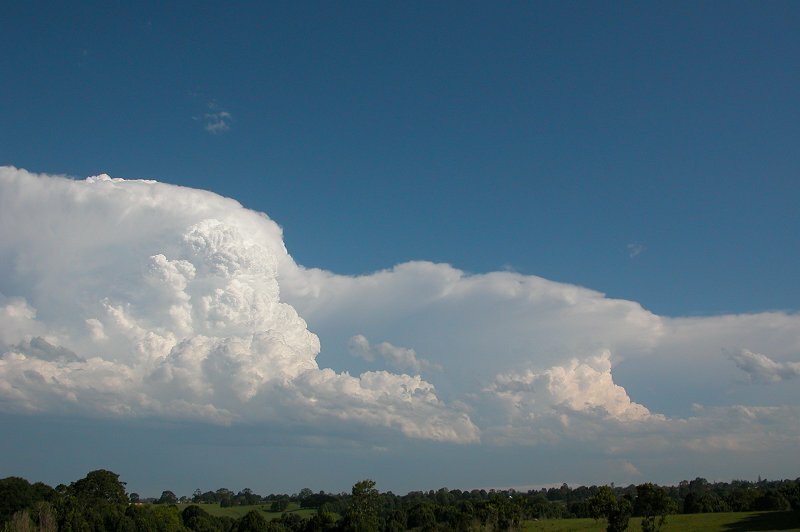 At 7pm I decided to shoot down to Ballina and watch the supercell in the hope so seeing some base features. 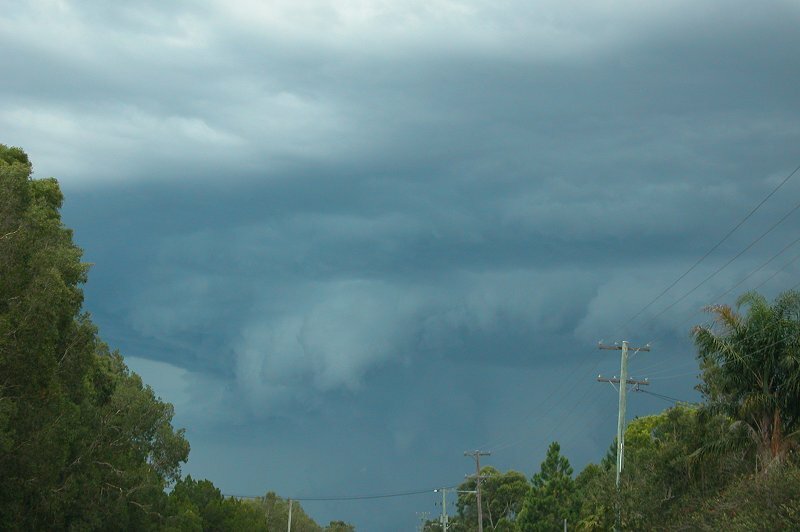 From Alstonville onwards i could see the large mesocyclone (but couldn't take pics while driving!) and the large inflow band feeding into the base. The storm was absolutely huge!! 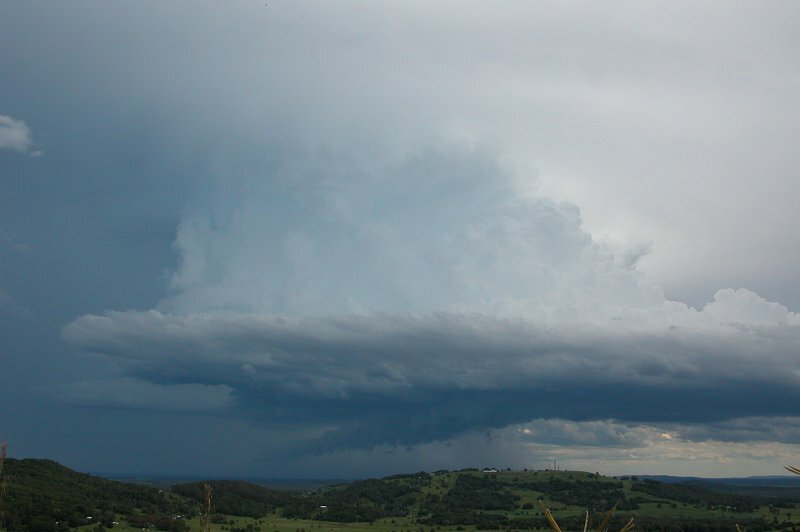 It was however beginning to weaken and veer more NE than N. After what seemed like an eternity I reached the north wall at Ballina and snapped photos of the supercell and it's large inflow band. 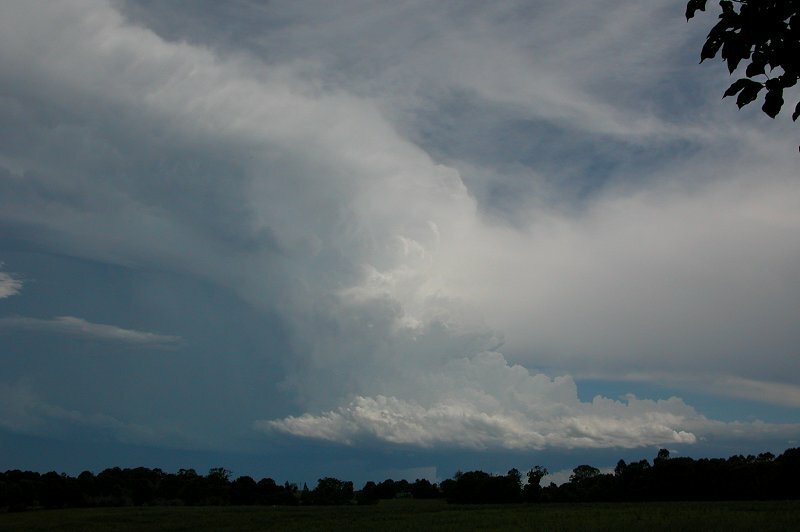 Further convection N of this supercell was illuminated nicely by the lowered sun. Beautiful branched CGs were keeping those on the wall watching the storm entertained! It was great being around a bunch of people who would gasp every time lightning would jump out of the back of the storm - just goes to show that most people do enjoy the spectacular show that thunderstorms produce! I had other commitments so I had to pack up and leave at 7.30pm, so didn't get a chance to photograph the awesome light show. Not to worry - the structure alone today was enough to satisfy me!! Well we had nice strong shear this day, along with good instability figures, however the moisture profile was really bad, with way too much upper level moisture and too little low level moisture. 850hPa temps were above 20C, and a strong cap existed. 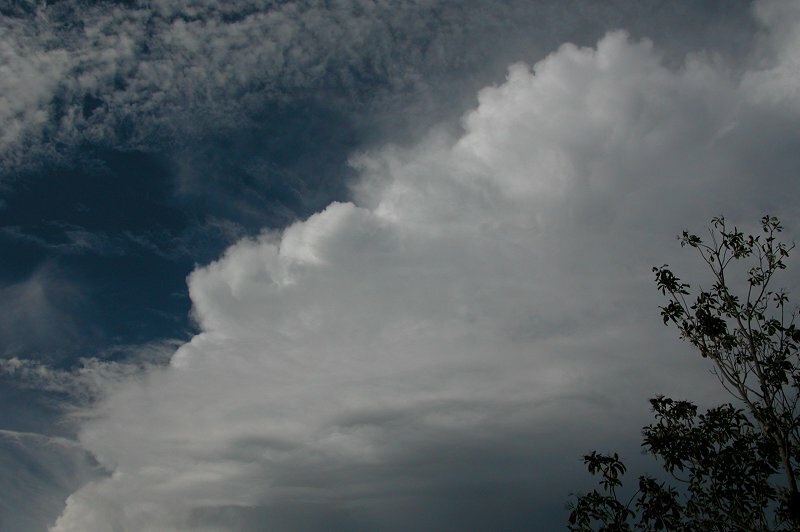 The day was dominated by thick high level cloud. 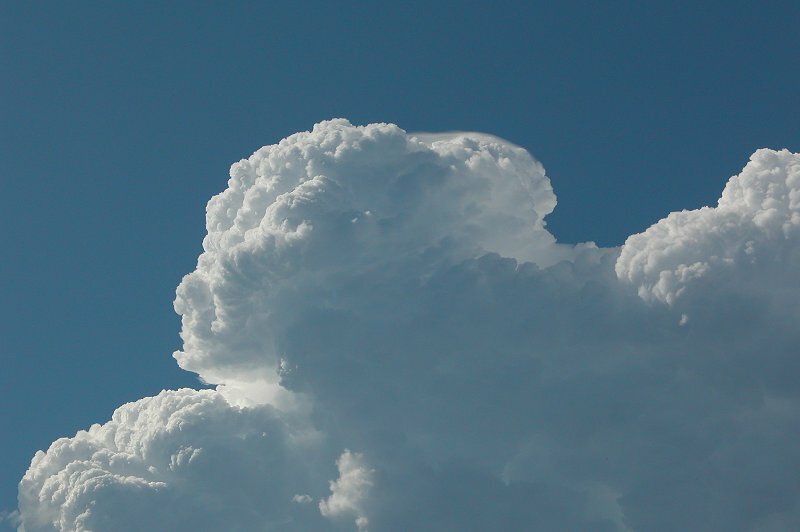 Still, some very high based/low topped convection popped up and gave some thunder and a brief shower over my home just after lunch. 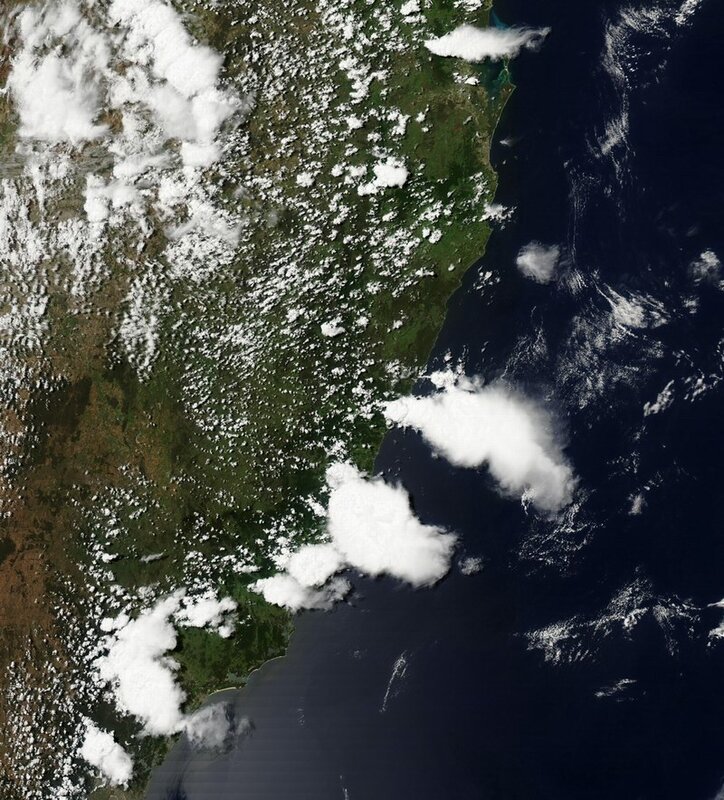 Unfortunately nothing much developed after that until after 5pm, when some convection on the clearing edge of the cloud band developed in S QLD/N NSW. 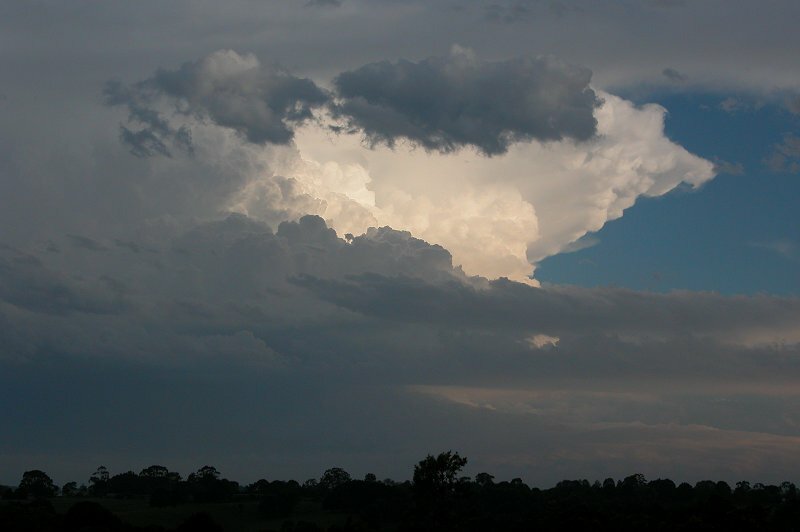 Around 6pm a nice storm was located near Tenterfield and was heading toward our area. At 6.20 it looked fairly weak visually, but did have a nice solid yellow/green/pink core or radar. By 6.40pm however, it looked like it was weakening both visually and on radar. 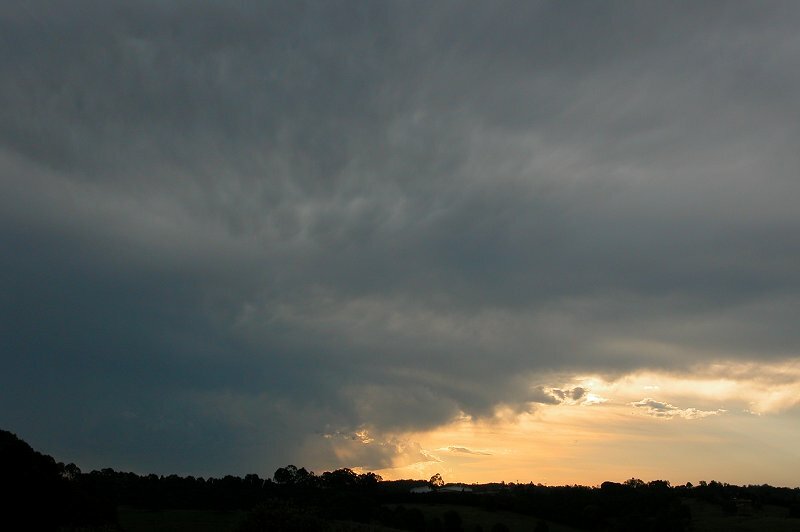 I had to go into Lismore briefly and hoped this would then develop into a chase, but it wasn't to be, and when I returned home at 7.45pm, all that remained was an anvil with a bit of mammatus. 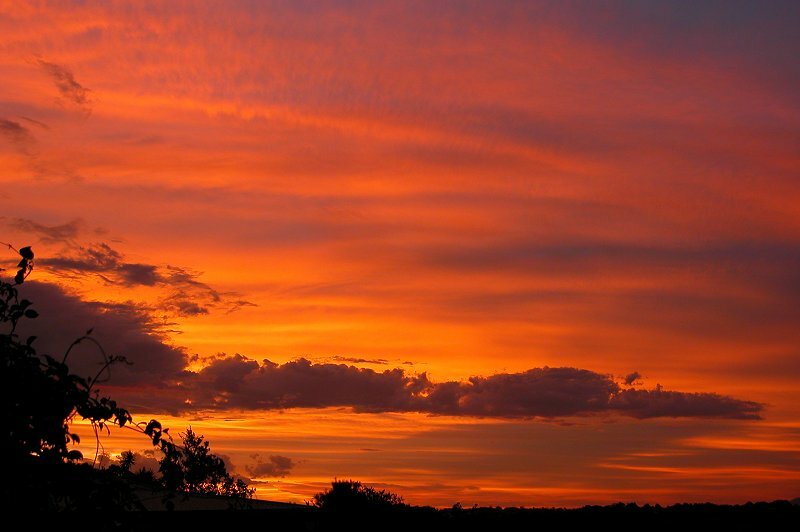 We were however treated to a very intense sunset which I quite happily watched evolve of a period of about 10 minutes. 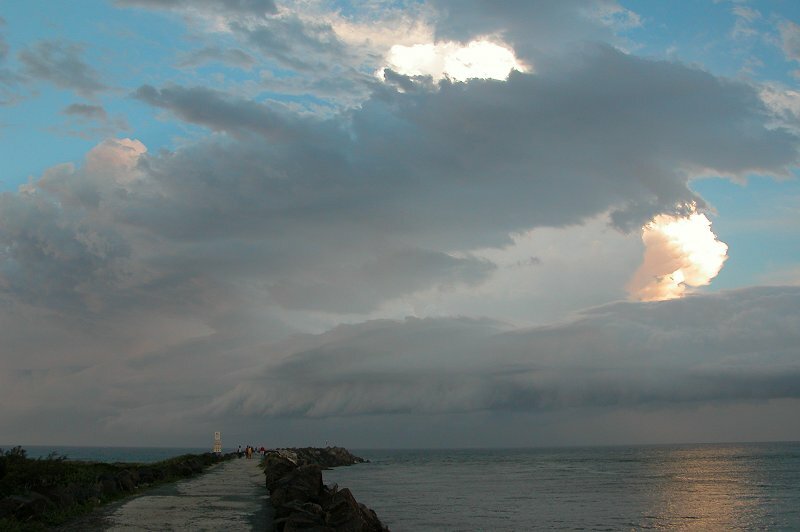 The storms that developed on this day proved that you shouldn't put all your trust in the models! 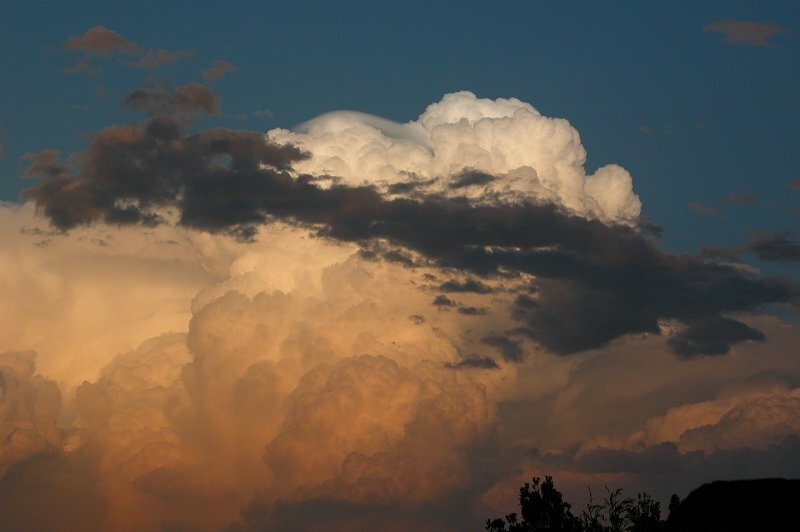 After reviewing AVN you would have been left thinking that there wasn't much chance of storms - it forecast that most of the moisture and instability would be pushed offshore quite early. After seeing that I didn't pay too much attention to other variables, but as it turned out it was an impressive setup! Shear was perfect for supercells - almost 90 degree turning between the surface and 700hPa, reaching 24kns @ 850hPa and 45kns @ 500hPa. Shear like that makes you consider the possibility of tornadoes occurring! The upper trough had not only strengthened wind shear, but kept the upper levels nice and cool, reaching around -40C at 300hPa. 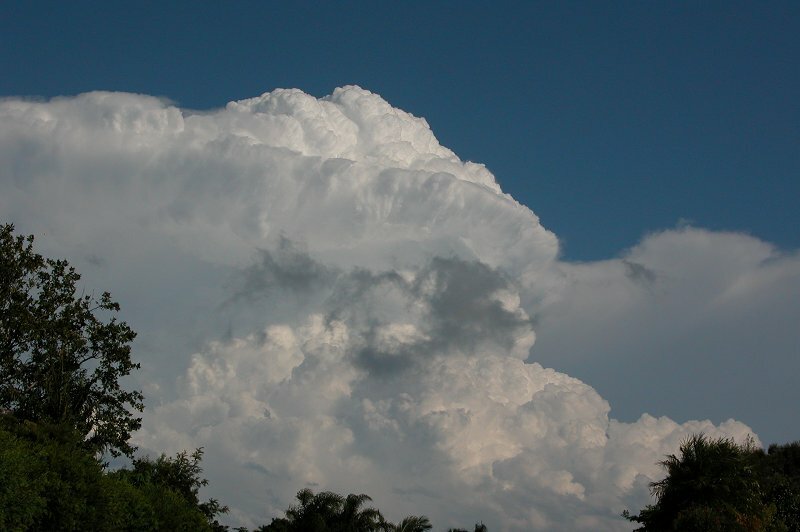 Weak convection started around 1.00pm. I noticed some weak congestus when I was shopping and figured that would be as exciting as it got. 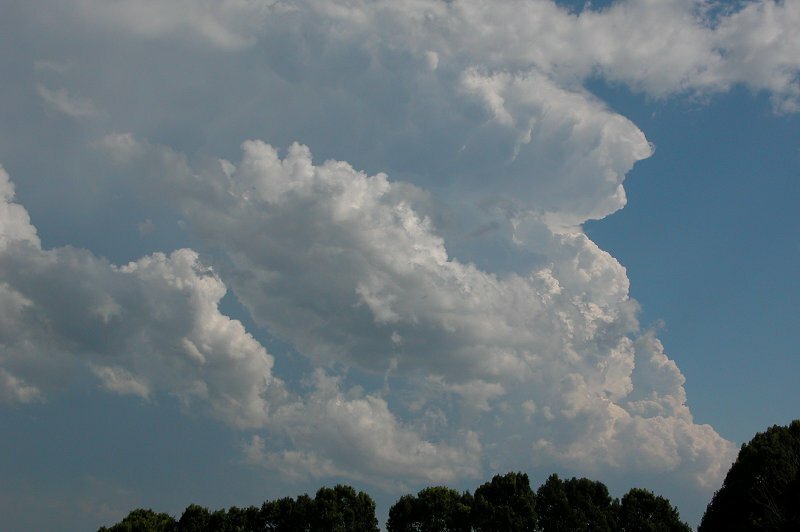 I got home and did some work when at about 1.40pm I noticed some convection developing just SW of Casino. It was weak, as expected and so I kept working. A quick check of DPs on the ranges to the west confirmed there was more moisture than had been forecast, which was encouraging! Around 2.40pm I went to get a visual on the activity which was now to my SW. I was shocked to see quite a solid looking anvil and a base that was actually quite low (compared the last couple of days). 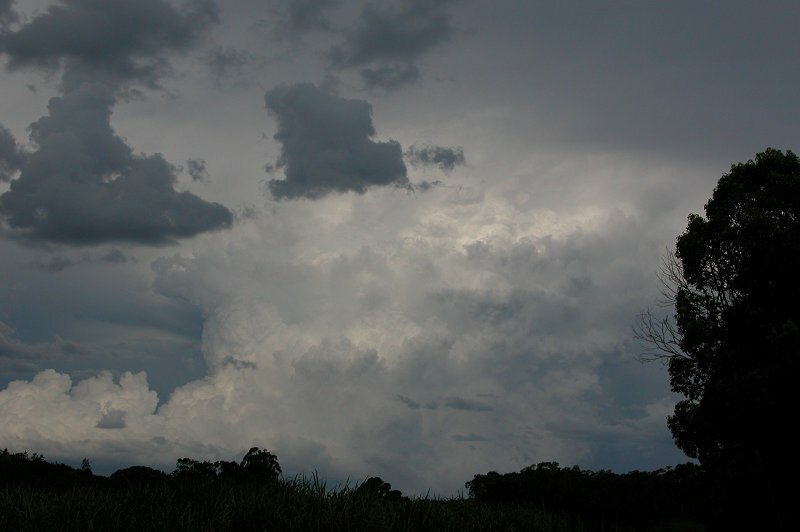 Storms were also developing in S QLD. 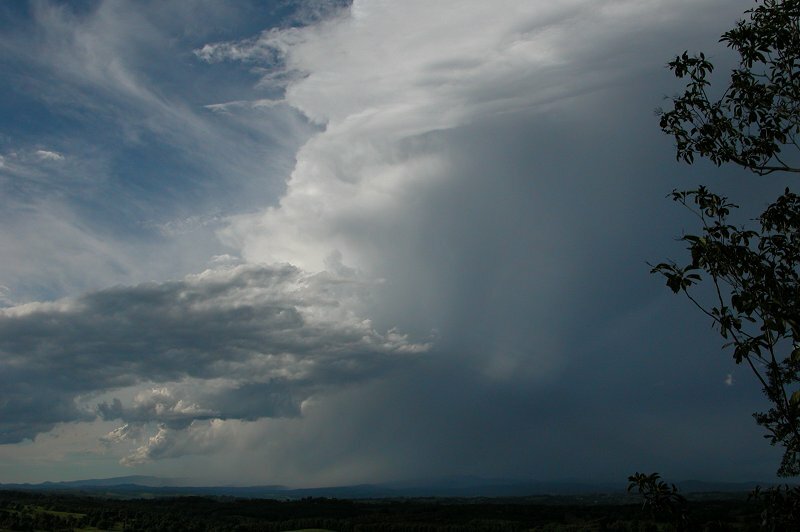 I checked outside again at about 2.50pm and the cell to my SW looked a little weaker. 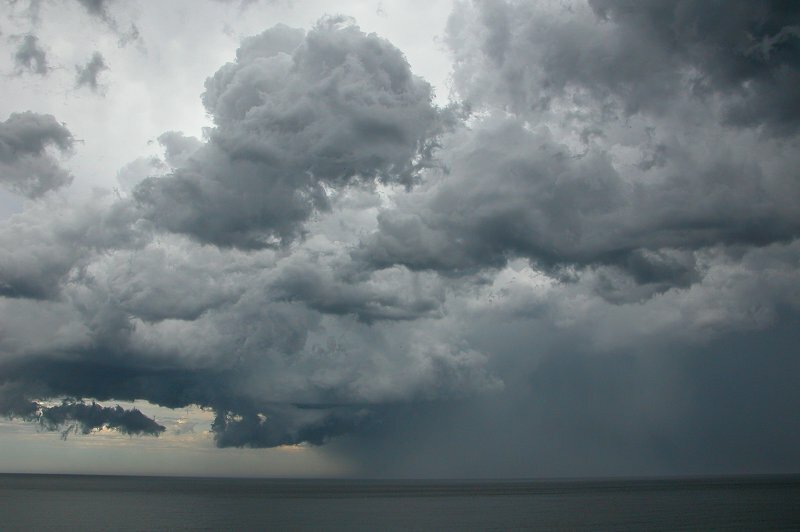 The updrafts weren't all that impressive anymore, so I went back to work inside. What a difference 10 minutes make! Another visual after looking at radar and seeing stronger reflectivities confirmed this cell was in fact quite well organised! 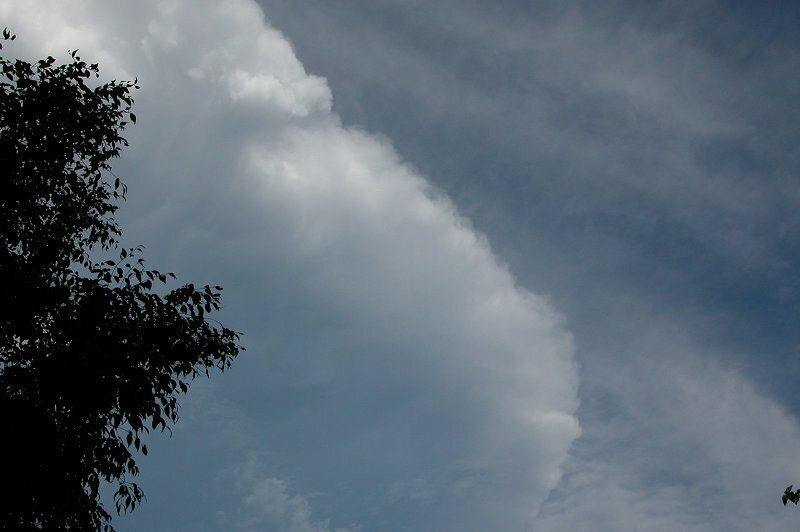 A rotating updraft was now obvious and it had an interesting lowering underneath it which was obscured by some trees. I didn't need any convincing to go chase, although I was a little put off by its SE track. I held hopes of it veering left as I ventured out to the southern edge of the Alstonville plateau. What I saw when I arrived at 3.20pm almost had me speechless!! A well organised, relatively fast rotating supercell with a lovely solid anvil spreading east and evidence of good low level inflow!! 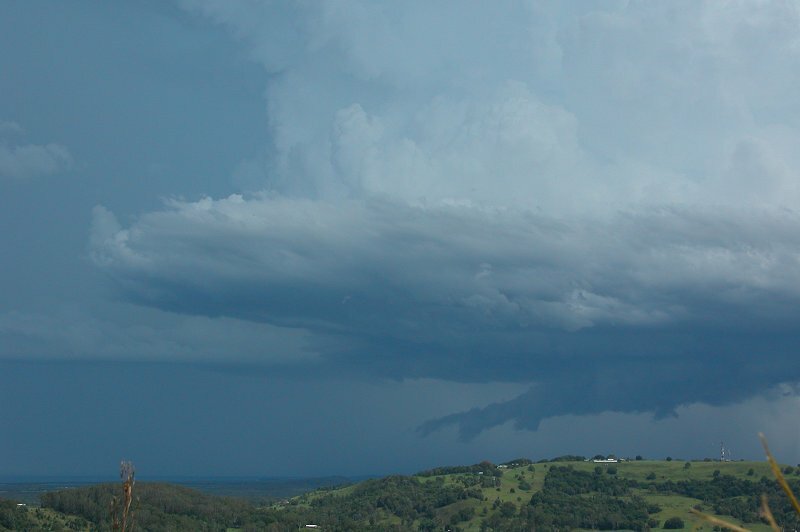 And a nice little wall cloud underneath the mesocyclone. 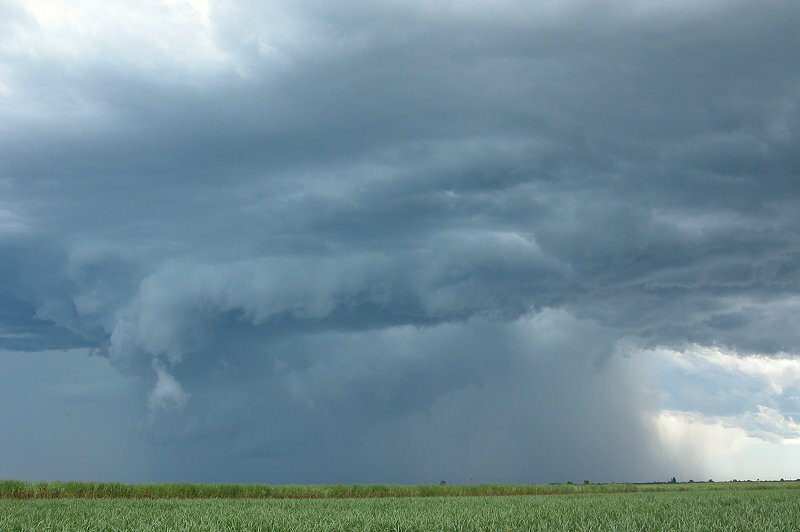 It was the fastest rotation I had observed in 3 years of chasing, and I was not really happy about the fact the video camera was in Melbourne on holidays with my parents! That meant no timelapse.....how frustrating!! So I snapped away with my still camera and watched it evolve. Michael Bath provided a radar update which showed a nice solid pink core and 90 degree turning to the left, from a SE track to a NE track....all in a 10 minute period!!! With the SMS radar update was a message from Michael saying 'does it have a tornado yet? '....well, it was not far off!! 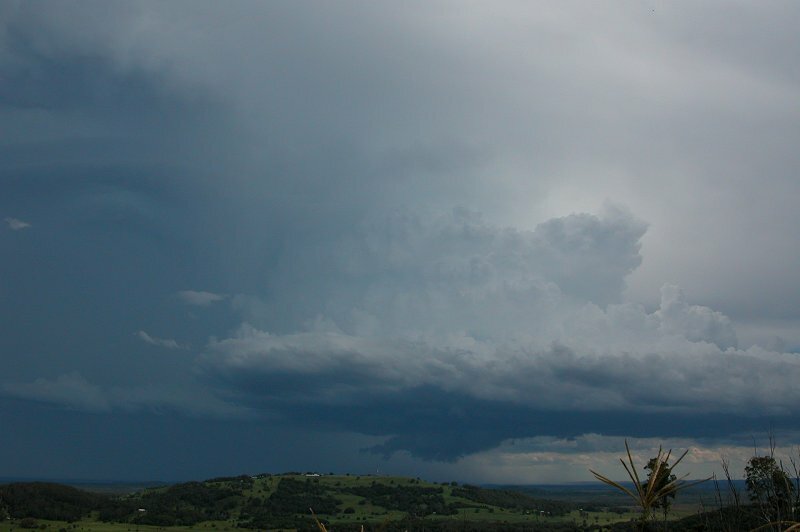 I watched as a rotating lowering began to extend from the wall cloud. 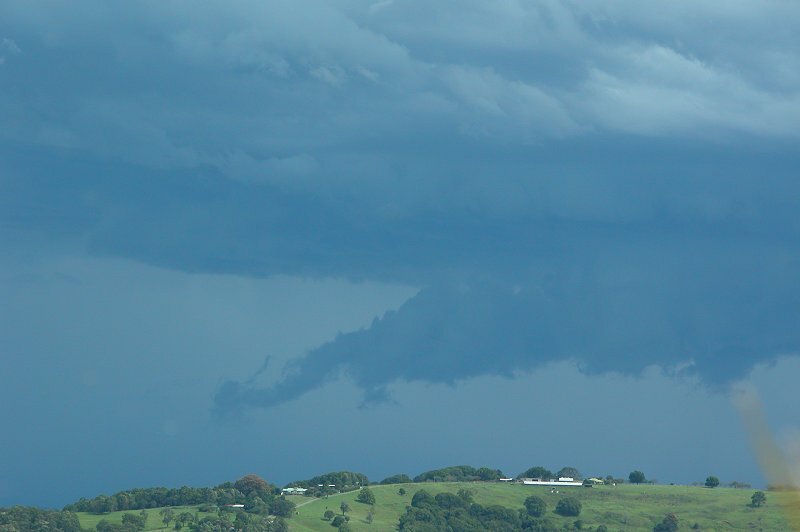 My eyes were glued to the funnel as it continued to extend from the wall cloud....would it touch down? It wasn't to be. It soon began to lose the rotation in the funnel, and it became some strange sort of lowering. I received a report from Wardell that someone had seen a funnel almost touch down, which confirmed what I had been observing. I was later to discover that the view from Evans Head was even more spectacular, with a very large gustfront and amazing green tinge preceding what was to be a severe hailstorm. 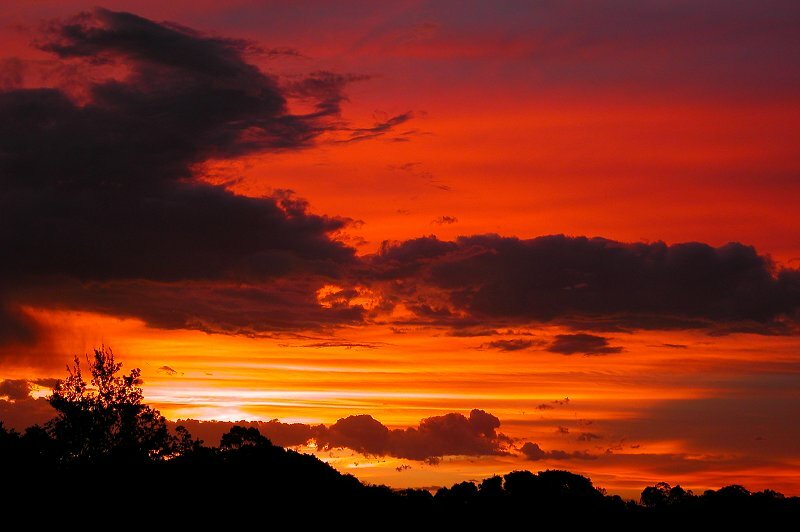 The following panorama was taken by Isaac Smith near the Evans River looking towards the western sky. It was now about 3.25pm and I decided I'd stay a little longer to observe the supercell rather than trying to get closer and possibly miss any further funnel development. 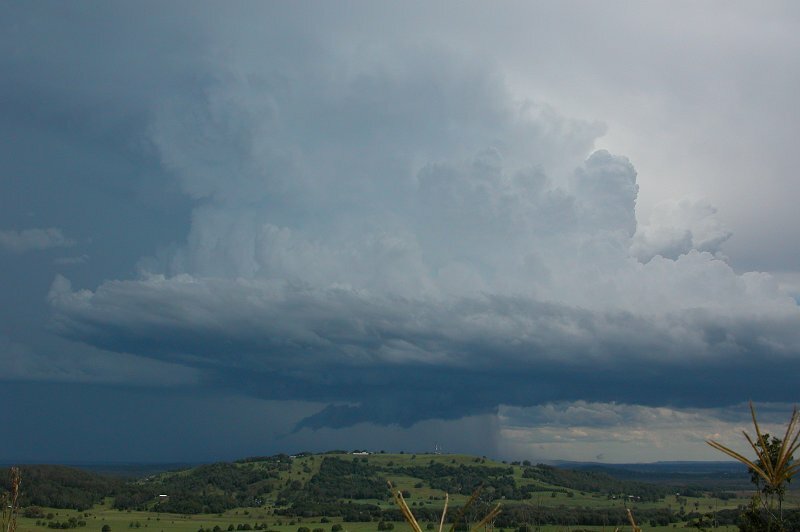 Updraft rotation remained strong, and it was clear now, looking at the rainshaft in the outflow region, that somewhere near Evans Head would be copping a large amount of hail! 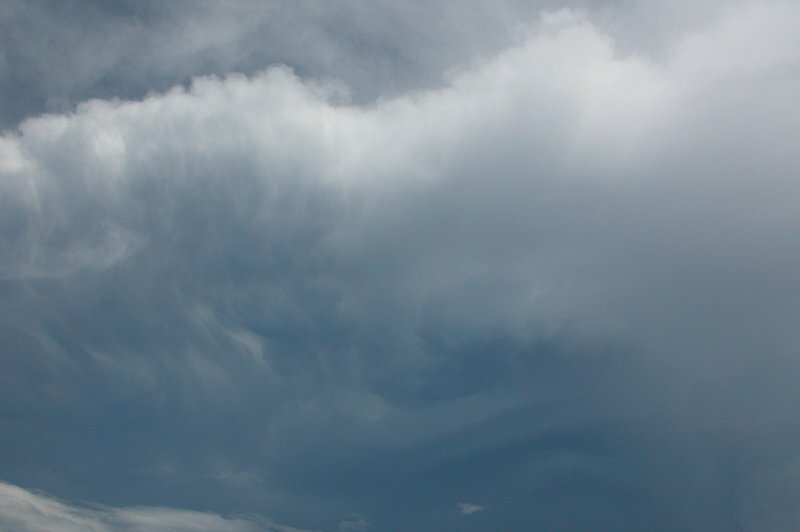 A couple of tiny funnels protruded from underneath the wall cloud, but were very short lived. 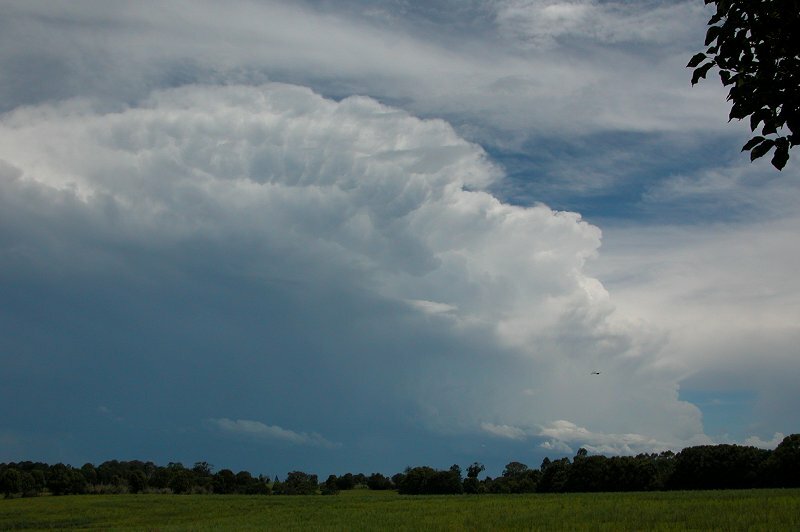 Several pulsating CGs jumped out of the updraft region into clear air behind the storm. I was soon on the Pacific Highway which has great clearings on its eastern side, so watching the storm wasn't a problem. 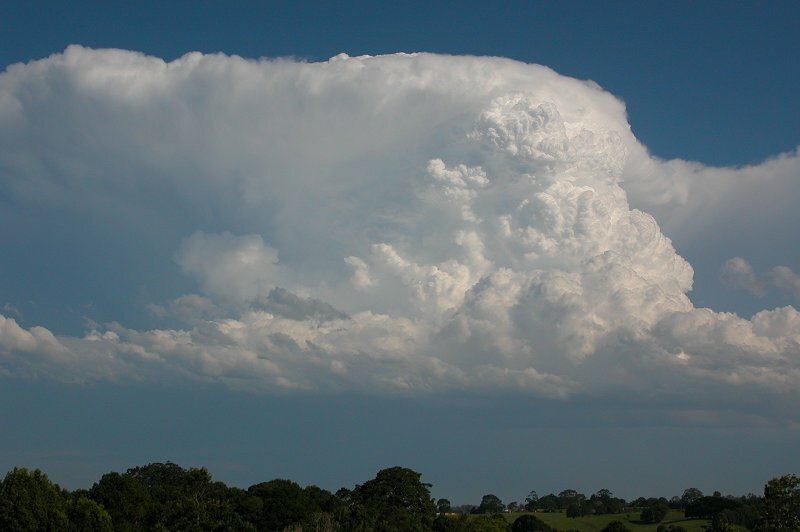 It did appear to have lost it's nice supercell structure though. 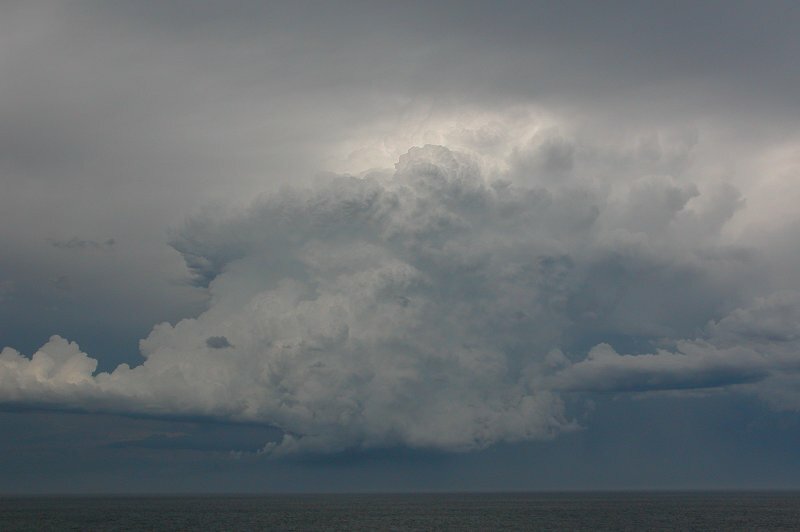 Some more pulsating CGs were observed on the trip south to Evans Head. About 3.50pm I stopped at the Broadwater National Park lookout to get some photos of the cell which was now out to see (it sure was fast moving!). It had some strange structure on it, but nothing really exciting. 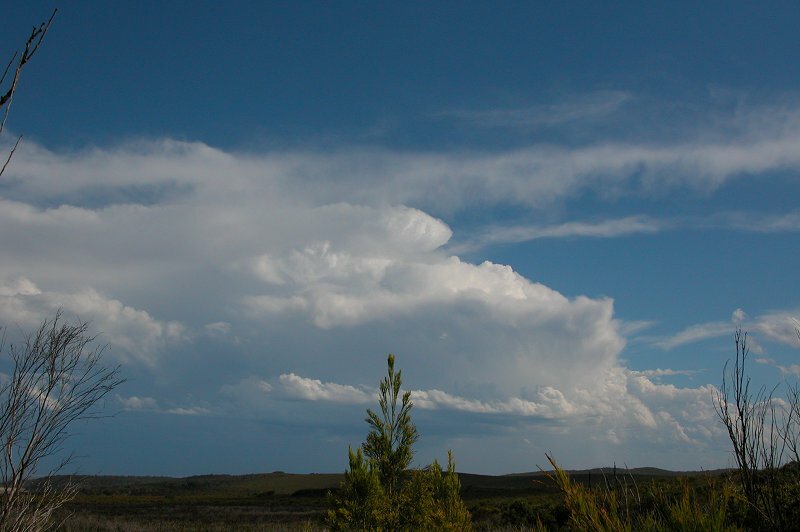 Another weak cell had formed behind it and was almost overhead, giving some thunder, but no precipitation. 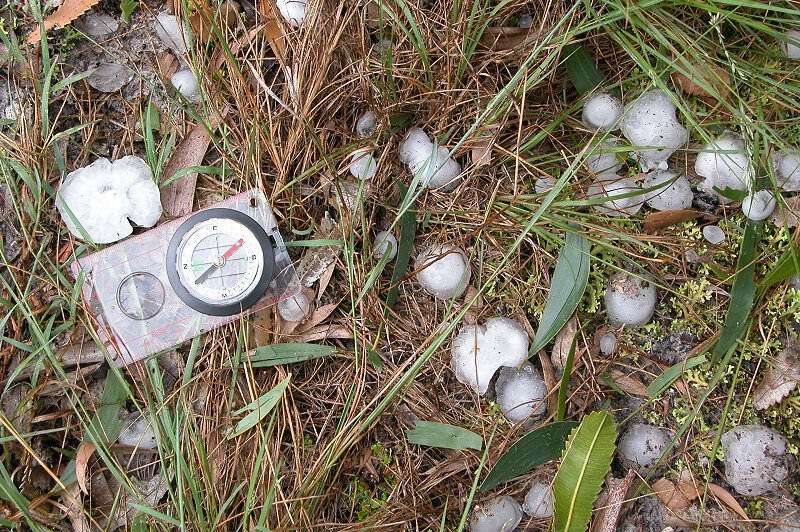 I decided to keep heading to Evans and find some hail! 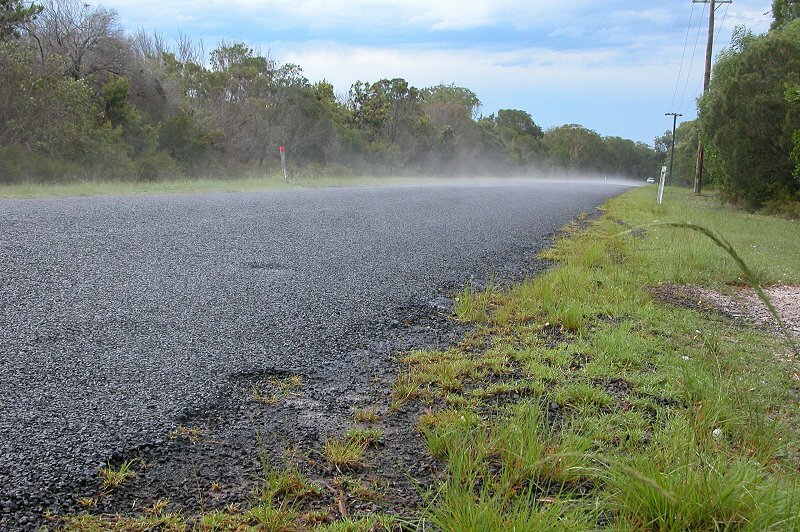 At 4.12pm, just after receiving a report of large hail at Evans Head, I came across fog over the road!! Every storm chaser knows what that means! So I quickly pulled over! 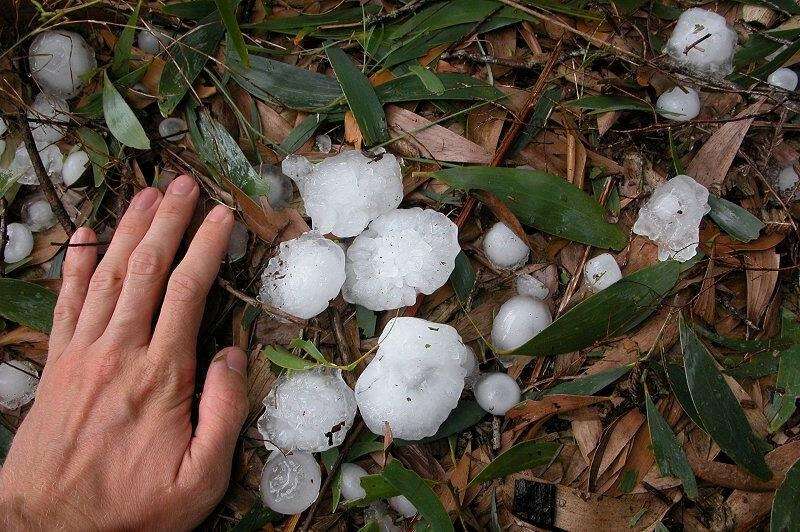 There were quite a few hailstones....and they were big!! It had been about 40 minutes since it had fallen and the biggest stone I measured was 6cm in diameter. I imagine 7cm hail is likely to have fallen from this storm. 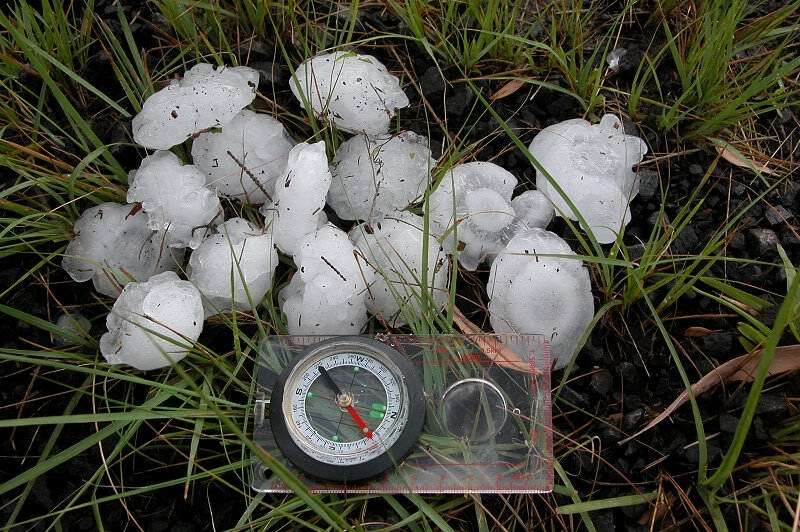 There were quite a few 5cm stones, with the average hail size probably about 3cm. 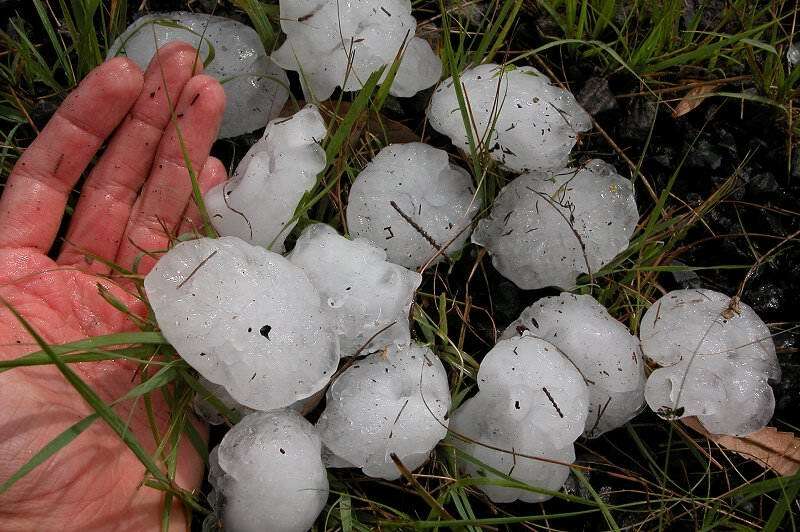 It was the biggest hail I had held in my hand since the January 17th Casino supercell in 2001 (although obviously the largest stone in the Casino supercell was much bigger than any produced by this supercell), so it was pretty exciting see! I headed into Evans Head at 4.30pm after playing around in the hail on the northern outskirts of the town. 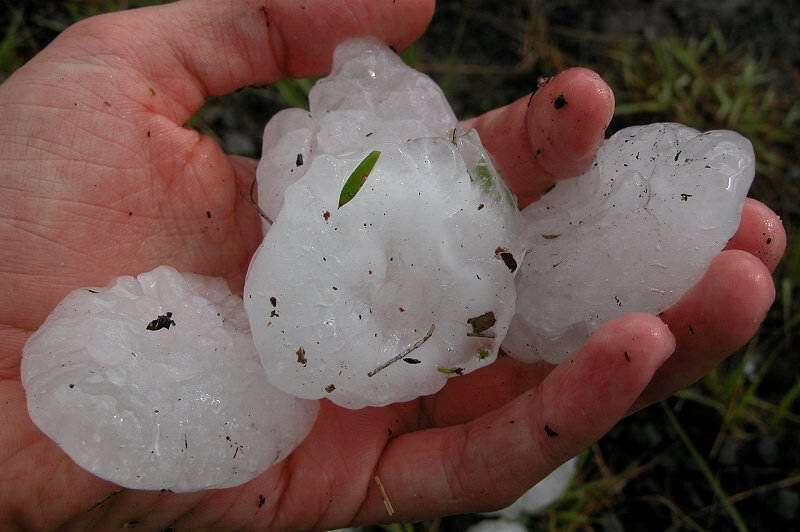 I couldn't find any hail in town, though a resident that lived on the southern side of the town said they got hail about 4cm in diameter. 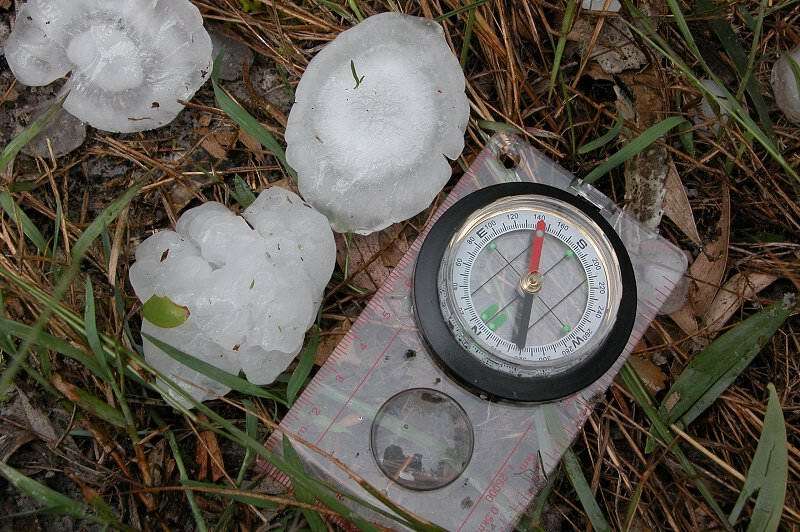 There was however evidence of large hail, with trees shredded by the stones and a few small branches down. I noticed a couple of parked cars with small dents, however it is impossible to tell if this is the result of the hail that had just fallen. I didn't see any smashed windows while driving down the main street of Evans Head. 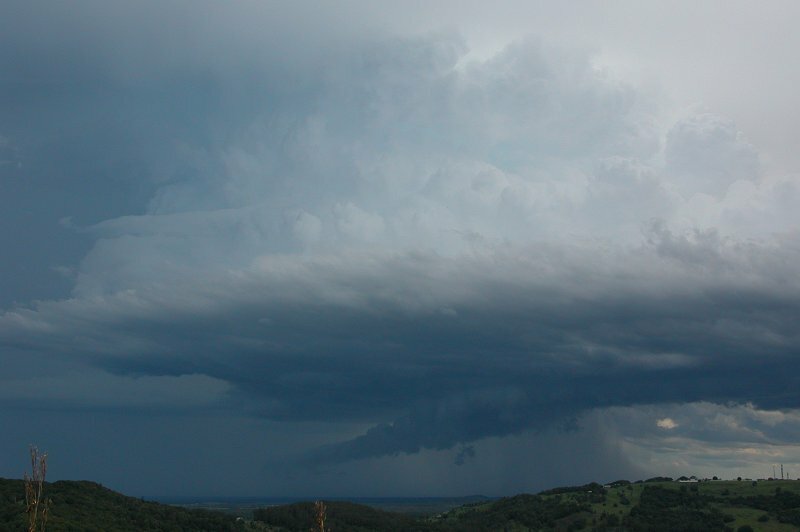 I headed up to a lookout on the southern side of town to observe a cell that was down near Grafton. It would have been interceptable had it not been going east! So I watched it slide past to my S at 4.55pm before heading back home. 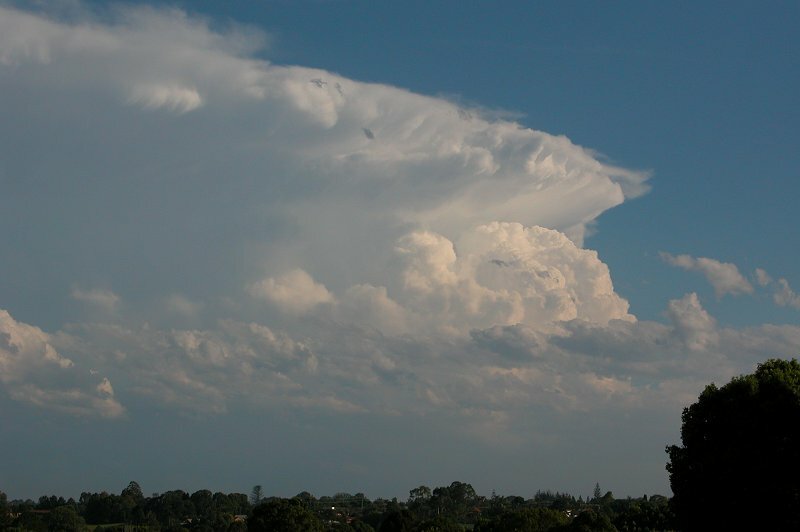 I stopped briefly back at the Broadwater lookout at 5.15pm to get some photos of the cell to my east and those to my south. 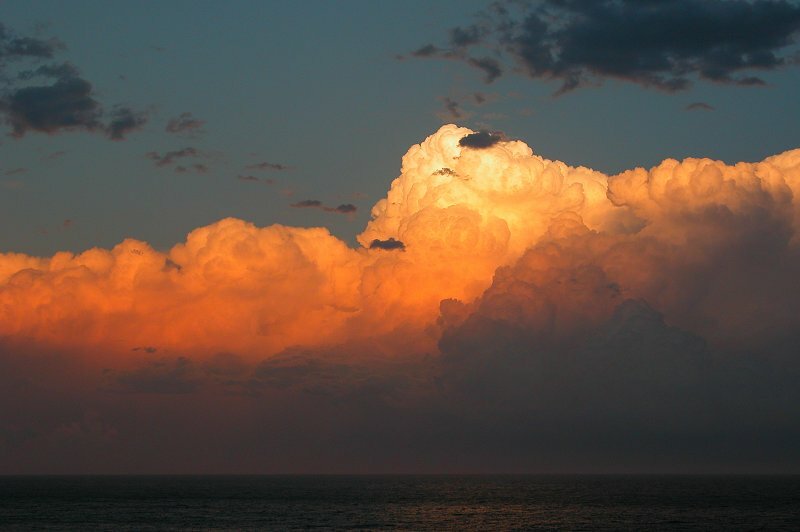 Storms really exploded once they got offshore. This photo taken at 5.20pm on the trip back home looked a little like a volcanic eruption! 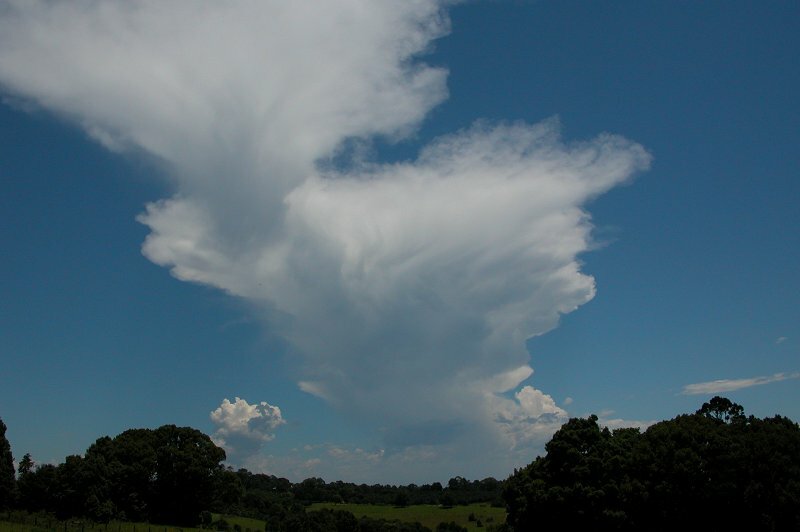 Nice crisp updrafts, although the contrast was poor with so much anvil cloud around. 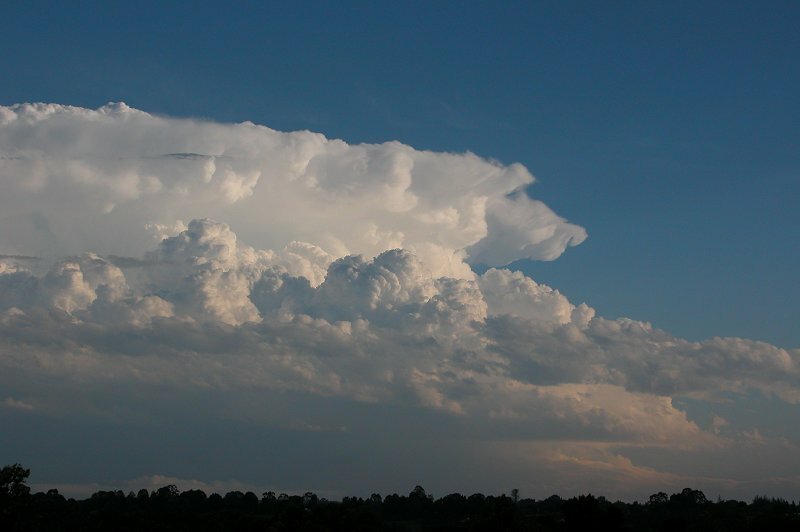 The following images were taken at 5.50pm when I arrived home of a nice strong cell to the NNW that Michael had been observing while I was out. Hopefully he can put some photos and timelapse that he took online. 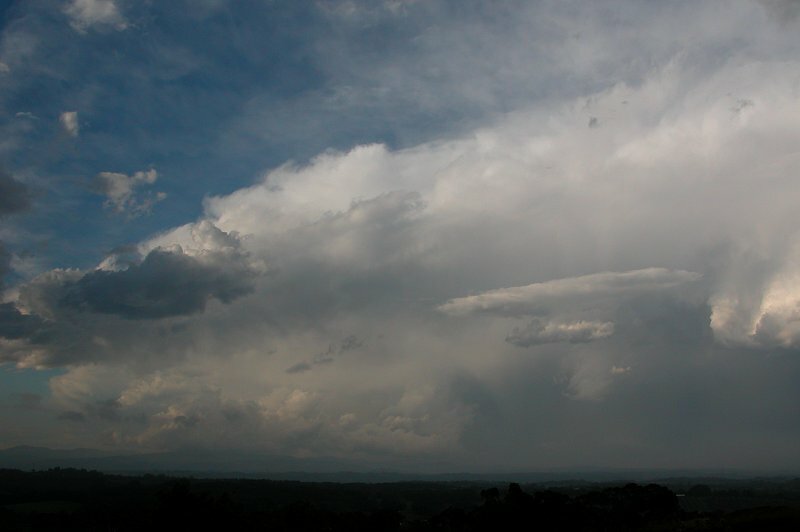 The last photo in the sequence is of the big storm that was way off to the east, again having nice solid updrafts. All the activity cleared out after this. 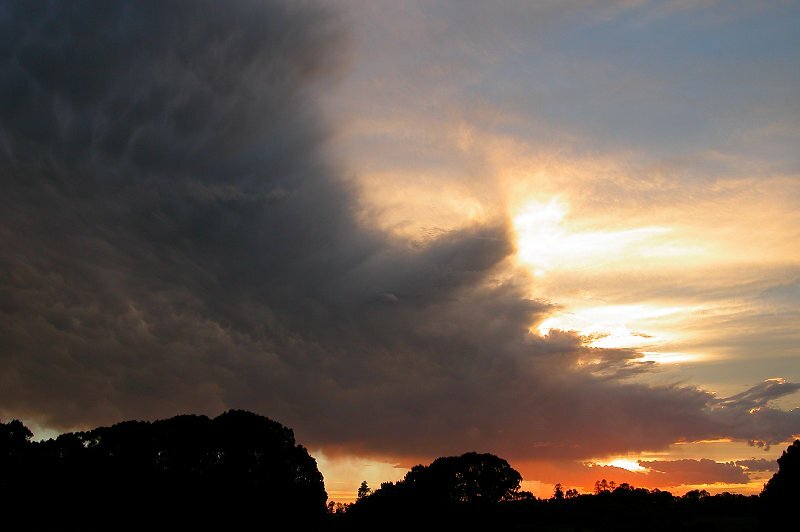 So that was the end of nine days of storms! The last day of the outbreak was definitely the highlight, but each day had provided something different. What an awesome opportunity to get out and do some serious chasing! It definitely made up for the more than average summer chase season we had experienced up until this outbreak.